Fanciful visions of the future were few and far between in the early 1940s. This article by Sidney M. Shalett, from the April 27, 1941 New York Times sums up why. It was on a Sunday morning - the last Sunday in April - two years ago when the great World's Fair opened: April 30, 1939. In cold print the date does not seem so remote, but in two short years the rush of history, with its swift, terrible violence, has turned that brave, new World of Tomorrow into an almost forgotten legend of yesterday. Shalett goes on to explain the sense of wonder surrounding the Futurama exhibit and the speech by President Roosevelt, officially declaring the Fair open. Two years have passed. Vanished into limbo are the hectic days of 1939 and 1940. What history has done to the memory of the Fair the wrecking crews have done to the physical structure of the once-enchanted acres. Like the dinosaur, the Fair had to go, but maybe it shouldn't have gone so quickly. Today it is almost all gone: an empty, sad shell by day; an unbearably lonely graveyard by night. The author ends the piece on a note of hope. Too many memories! It is best to leave this place for a while. It will be better to return in July. Then the first units of the great Flushing Meadow Park that is to rise on the site of the Fair will be ready. Perhaps there is symbolism in that, too. Out of the wreckage of yesterday's dream of the World of Tomorrow a place of recreation, rest and beauty is being fashioned for today. Where on April 30, 1939, throngs gathered "for peace and freedom," the wrecker is today finishing his work, clearing the way for a park of tomorrow. 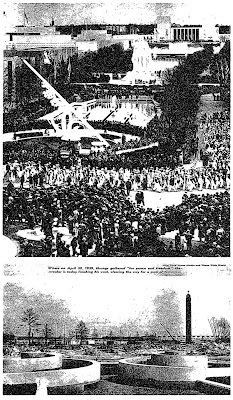 "Where on April 30, 1939, throngs gathered "for peace and freedom," the wrecker is today finishing his work, clearing the way for a park of tomorrow."